Although Naxos managed to speed out a similar collection a little ahead of this one, it’s really not in the same class with the Mode – the label spent more than a decade recording this set with artists that Berio himself favored. […]All of the interpretations are first rate, as is the annotation, photographs and sound, which retains a surprisingly consistent quality from track to track, as this 4-disc set was recorded all over the map over a long period of time. […] Berio’s music has a good chance of retaining currency within the future, and Mode’s Berio: Complete Sequenzas and Solo Works represents the gold standard in paving the way for his legacy. […] the level of virtuosity on these discs is staggeringly high; anyone interested in Berio’s solo pieces, perhaps the most important instrumental music in our time, should explore this collection. Mode’s recordings are almost invariably more detailed and confrontational, but inevitably a bit of a mixed bag. […]Even where the recording is less appealing the performances are always good, and most are superb. 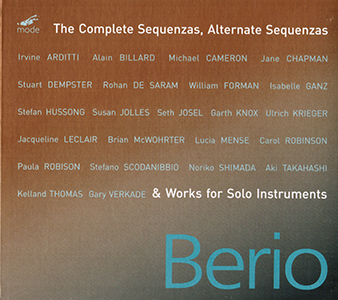 […]Berio: Sequenzas & Solo Works (Mode), collect the complete Sequenzas and offer a superb, if not superior, alternative to the pricey 1998 set on Deutsche Grammophon, which lacks the final Sequenza XIV composed in 2002. […] Mode enlisted several new music all-stars—Irvine Arditti, Carol Robinson, Stuart Dempster—and added a fourth disc of solo works. Also, I appreciate Mode’s inclusion of Edoardo Sanguineti’s optional prefatory spoken texts, all indexed on separate tracks. Essential.